Eloi, Eloi, lama Sabachthani? My God, my God, why have you forsaken me? One of Jesus’ most famous prayers, the Prayer of Despair teaches us that we can pray that way too. Just like those of Jesus, our feelings are valid and god wants to hear them. We are not the first to feel forsaken. We are not alone. Jesus prays politically and personally. How is the Lord’s Prayer political? How is it personal? Jesus prays for the next generation. If we’re doing it right, that should inform our ministry at Galileo. Jesus prayed for his food! (Thank you, captain obvious!) And we really should, too. How can we reclaim the meaning behind that practice, and combat the meaninglessness that sometimes comes with mindless habits? How to we pray in public, without saying “jist” all the time? And without piling on empty phrases, hoping others will hear? How is a public prayer like an e-mail, with our audience CCed on our message to God? What happens to metaphors when we overuse them? Or when they become outdated, in a new time, a new culture? 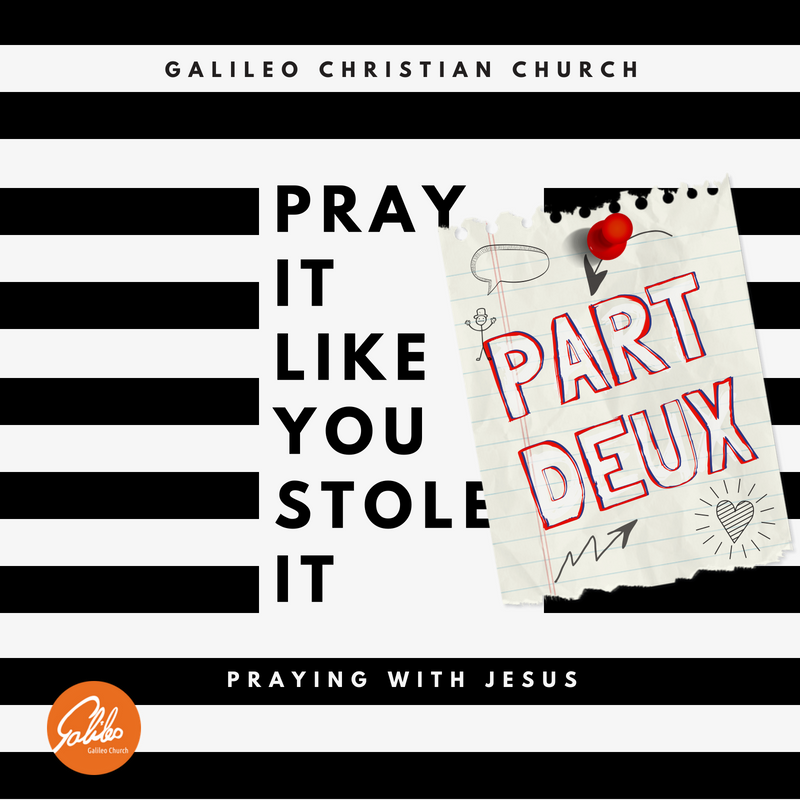 How do we pray as Jesus taught us, and keep our prayers relevant, at the same time? What I'm asking is: is God a DJ? Would you believe us if we told you that you already pray? We promise. You might not think you're "good" at it, but we don't think it's something to be "good" at it. It's something we just do. Like breathing. And pooping. Covenantal G-Groups meet in people's homes; they're on summer break and will start again for September-October-November quarter. Do you have one? Want one? Talk to Katie H.
Open G-Groups are, umm, open. Come to any of these, any time! --G-Kids, Sundays 3:00 to 4:30 p.m. at the Big Red Barn, 5860 Interstate 20 service road, Fort Worth 76119. K-8th grades. --G-Youth, Sundays 3:00 to 4:30 p.m. at the Big Red Barn, 5860 Interstate 20 road, Fort Worth 76119. 9th-12th grades. --G-Sunday School, Sundays 3-4 p.m. at the Big Red Barn, 5860 Interstate 20 service road, Fort Worth 76119. (On hiatus for the time being). --G-Coffee, Sundays 3:00 to 4:30 p.m. at McDonald's at 3200 SE Loop 820, Forest Hill, TX 76140. If you drop your kids for G-Kids, or just get to worship early, come have a cup of coffee on us. This McDonald's has a playground for your littlest G-Kids if you'd like to bring them along. --Little-G, Sundays during worship, for preschoolers. During the sermon, come hear Bible stories, sing songs, play games. --G-Study, Tuesdays mornings at 10 am at the Big Red Barn, 5860 I-20 service road, FW 76119. We read books, drink coffee, discuss. Starting new book 9/11. --Mansfield Bible + Beer,Tuesdays, 8 p.m. at Fuzzy's, 1601 Debbie Lane, Mansfield 76063. Let the conversation flow. --G-Craft, (usually) the last Friday of each month, 7:30 p.m. at the Big Red Barn. BYOCraft and BYOBeverages. -- G-D&D, 1-4 p.m. on a random Saturday each month at the Big Red Barn, 5860 Interstate 20 service road, Fort Worth 76119. See our website calendar for dates. --and of course, Worship,Sundays, 5 p.m. at the Big Red Barn, 5860 Interstate 20 service road, Fort Worth 76119. Beautiful and true. Discernment is communal. Jesus gives us everything we need to discern together what's next. Can we finally understand what the Loaves and the Fishes mean? "Evangelism" can be a loaded phrase. Lots of us, including our preacher for this week, have some baggage attached to it. What does it mean to be an evangelist like Jesus? On a large level, or a small level? It's nice to think about what churches and non-profits and altruistic organizations do for justice, but sometimes it can feel like you, or me, can't do all that much. What does Jesus have to say about that? Listen and learn what the loaves and fishes mean for us, in our everyday participation with out church community. To learn more about our work with Mansfield ISD, search out our group, "Mansfield Equality Coalition," on Facebook. Join it for updates. Also check out our writings, where we have printed several of our speakers words when they presented at school board meetings. To learn more about our work with ACU, check out our love letter. This sermon discusses why we believe God Gets Everything God Wants (yes, really!). It talks about Faith and Community and Spiritual Gifts. For more on those topics, visit galileochurch.org/sermons-by-topic. 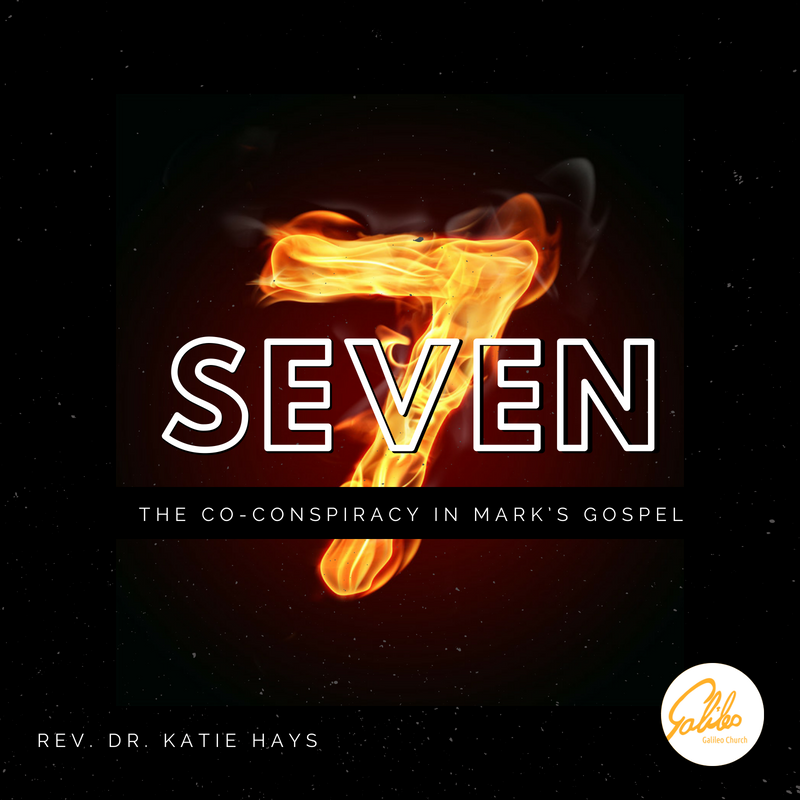 This series is on track with the Revised Common Lectionary (sort of). We use that sometimes, when it's right for our church in its current context. These texts in the middle of Mark speak to the habits of co-conspirators at Galileo. We have 94 of those this year! Thanks be to God. This first one is on graciously receiving care from the Church, whether you're a high-up official with money and servants, or a lowly bleeding outcast with medical bankruptcy and a lot of reasons to hide. Which one are you? Have you ever read or heard about Sister Sheerah? Did you know that four tiny verses filled with impossible-to-pronounce names could generate a whole sermon? You're about to. All of the above. Do you know their names? Shiprah, Puah, Jochebed, Miriam, Pharoah’s daughter, and her maid. Six badass women, all represented by that one image of the woman with the halo and crown. 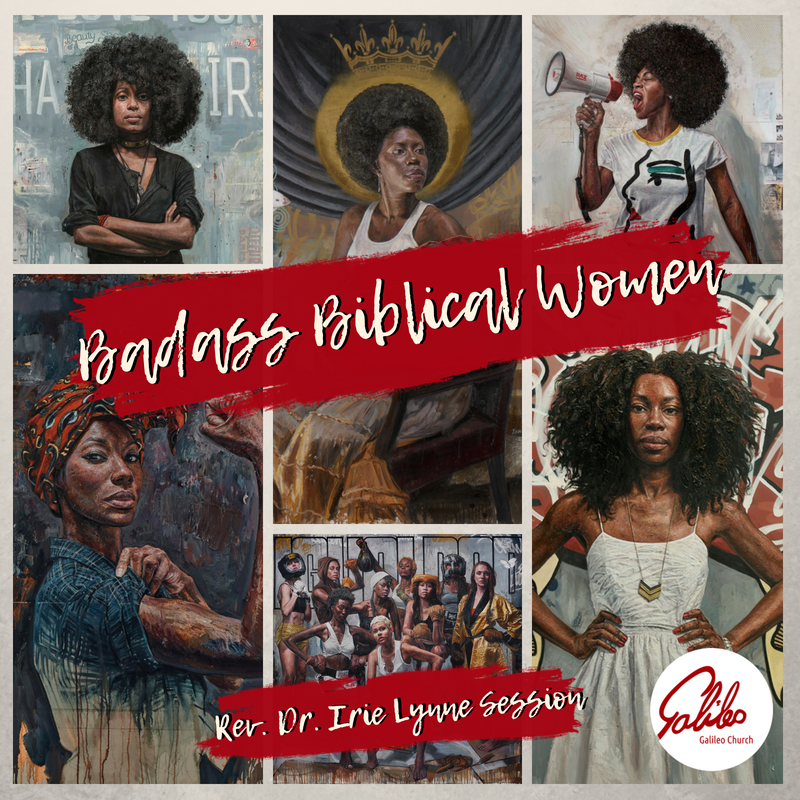 Over the next six weeks, we will learn about all of the Badass Biblical Women pictured in that gorgeous album cover. Can you guess who they are?